A number of significant changes have been made to Twitter’s iOS and Android apps this week — improving search and removing access to a number of video services — and now it’s the turn of the BlackBerry 10 app. Developed by BlackBerry, not Twitter, the app is getting a number of standard features from other apps. Though the Z10, the first BlackBerry device, is not out in the US yet, the company has claimed that sales have exceeded expectation. This update is noteworthy since it is the first set of changes for the app, bringing a number of seemingly obvious (and much needed) features. For example, the compose tweet screen now supports the addition of photos, the option to send a direct message is positioned under the ‘Me’ tab — as on other mobile apps — while profile pictures, header images and bios can be edited and changed directly from a BlackBerry 10 device. Equally, images now show in full screen and are zoomable, while users can be blocked and reported as spam from the app, among many other tweaks. Twitter recently brought its Windows Phone app in line with its other mobile apps, while it has also committed to develop a native client for Mozilla’s Firefox OS, which is due out later this year. The LinkedIn for BlackBerry 10 app has also got a glut of standard features added, but there’s no news on the Facebook app. Doing more on the Compose Tweet Screen – An enhanced Compose Tweet Screen allows you to take a new photo or add an existing one, add your location, and offers a shortcut for “@”. Composing Direct Messages – It’s now easier for you to compose a Direct Message – you can do it right from the “Me” tab within the app. Viewing Direct Messages from your contacts is also available in the BlackBerry Hub. Edit Profile – You can now edit your profile picture, header, and details from your BlackBerry 10 smartphone. 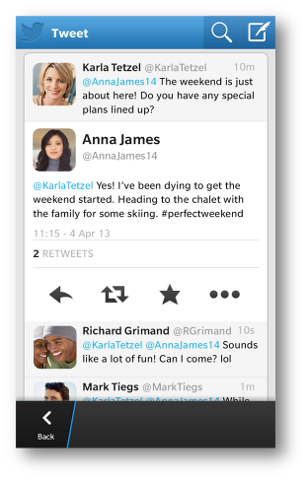 Conversation view – You’ll see full conversation history when clicking on a Tweet. Improved Image Viewing – You can now view pic.twitter.com full screen images, as well as pinch to zoom and pan images from the Tweet details. Also, you can view full screen profile pictures from other Twitter users. Deleting Tweets – You are now able to delete your own tweets from any screen where their tweet is displayed. It’s as simple as holding down on a tweet and selecting the trash icon. Block and Report as Spam – Block and report users as spam. Enhanced Menu – Do more from the timeline, with new options to “Quote Tweet” after selecting “Retweet” as well as “Open Tweet” to view the tweet details page.